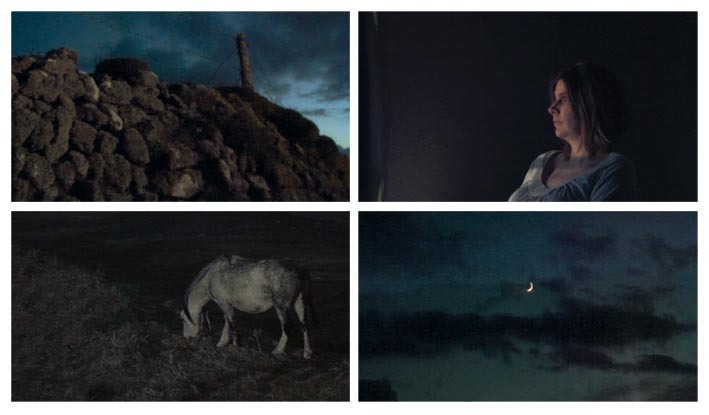 Recent work by Ruth Jones has focused on relationships between humans, animals and the land in Pembrokeshire and explores the magnetic pull that particular places have for people. Drawing on mythological crossings between humans and other animals, Ruth’s video installations and public art projects look towards greater fluidity between self, others and the environment. Vigil explores the presence that Strumble Head Lighthouse has on the surrounding landscape in North Pembrokeshire. Strumble Head was built in 1908, and its rotating beam can be seen for thirty miles in all directions. Every lighthouse has its own distinctive “character”, recognised by a pattern and duration of flashes, in this case one flash every two seconds four times followed by seven seconds of darkness. Vigil explores how this rhythm has permeated the land for over a hundred years, seeping into the psyche of its inhabitants. The installation also explores the lighthouse as a threshold place, situated between land and sea, day and night and human and animal kingdoms. Using Strumble’s regulated light pattern as a guide for editing both picture and sound, the film invites a quiet contemplation of the internal and external rhythms that influence our daily experiences, rituals and memories. On the opening night, GWRANDO perform a live sonic event that responds to and interacts with the installation.